​Benzara Inc. is a leading Importer & Wholesale supplier of Home Decor, Gifts, Home Furnishings, Indian Handicrafts & accessories. Enriched with a vast experience, Benzara Inc. has managed to stick firmly to its unique way of working i.e. working with a passion. Benzara Inc. is a leading Importer & Wholesale supplier of Home Decor, Gifts, Home Furnishings, Indian Handicrafts & accessories. Enriched with a vast experience, Benzara Inc. has managed to stick firmly to its unique way of working i.e. working with a passion. We offer hundreds of products we stock in our warehouses for wholesale prices. Wholesale Rates will be enabled to view on the website once the Wholesale Account is opened and confirmed by us. Evergreen Enterprises, Inc. is the world leader in wholesale design, production, and distribution of fine home furnishings, home & garden, sports, and fashion accessories. We design, manufacture, and distribute products to retail establishments worldwide. Evergreen Enterprises' mission is to enhance life by providing exceptional home and garden decor products known for their quality, beauty, and functionality. We are committed to the practice of free and fair trade and are respectful of our global business partners as well as the environments in which we all operate. For over 20 years the Abbyson family has taken great pride in creating home furnishings that continually redefines itself through modern-day living, while keeping core and timeless values first and foremost. Abbyson inspires the American home with pieces of comfortable luxury, revitalized beauty and timeless durability. We invite you to browse through our website and learn more about our brand. Abbyson Living offers a Drop Ship Program which is designed to deliver home furnishing products directly to your customers without you having to invest in stocking any inventory. Our program provides you with access to promotional pricing, high resolution lifestyle product images, corporate client service specialists, and detailed product descriptions! We are looking forward to building successful partnerships for many years to come! Calderon Textiles is a market leader with more than two and a half decades of expertise serving the hospitality, healthcare, textile rental and retail markets, Calderon Textiles maintains a dependable supply of top quality products at affordable prices. With an experienced group of textile specialists on staff, we will stay involved throughout the entire production process to ensure timely delivery of your finished linens and guarantee your needs are met every step of the way. At Calderon Textiles, we pride ourselves on being a full-service consultant to our customers. With partner mills in over six different countries, we continue to uphold a quality-intense manufacturing program. We recognize that your industry is constantly changing, and therefore we make sure we understand your operations and objectives and gain knowledge of your product and inventory requirements. Carson Home Accents is a wholesale manufacturer and distributor of specialty home and garden decor products. Carson Home Accents is a recognized leader in the gift, garden and home décor markets. With over 8,000 customers in the U.S.A., Carson has consistently proven the enduring appeal of our products and our devotion to customer satisfaction. We hope that you take the time to visit our web site and we hope our website is another useful tool to improve the quality of our relationship with you, our valued customers. We have large collections of home decoration items such as bath rugs, wall clocks, metal stools, poofs and seats. We add new assortment based upon market trends. Our warehouse is located at Sterling, VA. We ship directly and do not use fulfillment center. We will provide product content/description included high resolution images for uploading to your website as CSV files. We also provide two times daily inventory feed. We support all technological integrations including EDI, AS2, FTP/ sFTP/ Webservices/ API/ XML for providing Product/Inventory/Order Feed We offer a great drop shipping program for Retailers or Ecommerce sellers who choose not to stock items and only buy as they sell. For more information please contact us today. Koehler Home Décor offers quality wholesale home decor products and low flat rate shipping. Our wholesale products are extremely popular in furniture outlets, gift shops, home decor stores, online auctions, restaurants and specialty shops. Our wholesale distribution encompasses the United States and Canada and we provide free drop shipping services for online merchants including eBay stores. We provide a cost effective solution for businesses that purchase in small quantities as well as businesses that purchase in bulk. We supply companies requiring promotional gifts and in house decorating accessories. At Classic Touch’s online wholesale distributing center, we offer a large variety of stunning, antique-style high end home décor products, including bathroom accessories, bowls, boxes, candleholders, candy dishes, clocks, European flowers, flower pots, glassware, jars, lamps, pitchers, plates, servers and trays, urns and vases. With our impressive range of products, Classic Touch is the leading online store for high-quality, hand-crafted high end home décor. We hope that you will share in our enthusiasm and passion for superior quality, beautifully designed treasures. Couronne Company is a leader in the home décor and glassware industries, Couronne continues to be a competitive source and will always be committed to its valued customers. With a dedicated effort to supply superior products, exceptional customer service, and timely delivery all at a competitive price, Couronne recognizes the needs of the customer both in product selection and service. Couronne Company continues to be a trendsetter in the industry and strives to offer a vast array of styles and designs to suit all tastes and price points. Couronne is grateful to its clientele and appreciates the opportunity to continue to serve the industry. CottonAge.com is a Manufacturer and Direct Importer of fine Turkish cotton bathrobes and towels. Most of the bathrobes and towels we offer are manufactured in Turkey while a few select styles and Spa Accessories are imported from our partner manufacturers for a wider variety of product selection. As a California based direct importer and wholesaler, we have cut out the “middle-man” and are able to provide luxury products at the lowest possible price without sacrificing quality. All of our bathrobes and towels are designed to meet Five Star Hotel and Luxury Spa superior standards. Some of our valued customers include Marriott, Crowne Plaza, Hilton, Planet Beach Contempo Spa, and many more hotels, resorts, spas, salons, massage and natural therapy centers, corporate businesses, wellness centers, embroiderers, fitness centers, physician’s offices, recreational and community centers, schools, wholesalers and retail stores. We keep thousands of bathrobes, towels, slippers and spa accessories stocked in our warehouse to accommodate our customers’ same day shipping needs. Our goal is your 100% complete satisfaction. At Homespice, we have a variety of high quality rugs and furnishings. We have a large inventory of primitive home furnishings to choose from that’ll add that extra elegance and country feeling your customers been looking for. Our products are carried by approximately 2,200 dealers throughout the U.S., Canada and select dealers in Central America and the Caribbean. These dealers range from traditional gift stores to furniture and home decor stores to hardware and patio stores to design studios and galleries. A sector of our dealers are e-tailers. Our drop ship program is an easy way to build sales as well. Call us today for more details. Foust Textiles is one of America's top value textile products wholesalers. Foust has earned the reputation for quality customer service, superior industry knowledge, and value-packed products. We are located in Kings Mountain, NC and we ship a wide variety of textile products to all 50 United States and numerous foreign countries. Our modern warehouse is also open weekdays to the trade and you are welcome to visit us. Our product mix consists of approximately 50% quilting products, 20% apparel, 15% home decor, 10% event planning and 5% special occasion/bridal. Our customers often tell us that our friendly service and excellent product mix are what makes Foust Textiles one of their favorite suppliers. We are here to help you succeed in your business. Our group is composed of a variety of companies all dedicated to the manufacturing and distribution of high end linen and linen products. The company is a result of the merge of two traditional linen weavers: Libeco founded in 1864 and Lagae founded in 1858. ​Since the merge in 1997, the company has grown steadily and today accounts for more than 6o% of total Belgian linen production. Libeco-Lagae Inc. is our company located in New York City servicing the Northern American market for Libeco Fabrics & Libeco Home. 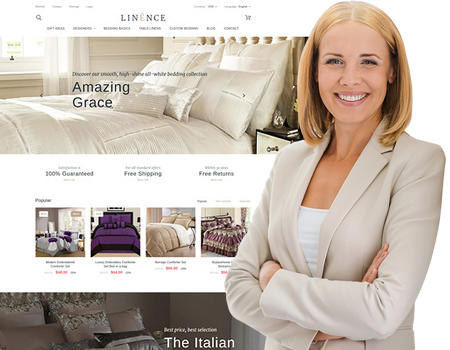 Libeco Home Stores NV is a Belgian company dedicated to the promotion of a "full linen concept" in retail and E-commerce. Home Fashion Designs is a family owned and operated retailer and wholesaler of discount home goods. Compare our prices to the big department stores and you’ll find that our discount rates are up to 80% lower than our competitors. Shop the same premium, high-quality bed, bath, kitchen and home products you’ll find anywhere else for the lowest prices imaginable at Home Fashion Designs. 100% satisfaction guaranteed. Infinity Instruments was established in 1995 and has grown to be an industry leader in clocks, wall décor and weather instruments. We offer a spectacular variety of clocks featuring wall, alarm, table top and indoor/ outdoor pieces. Thank you for choosing Infinity Instruments Ltd. We want to help grow your business and we look forward to being a part of your retail success. Architrex is a national supplier of Italian porcelain pavers, structural and interlocking deck tiles, and adjustable height pedestals for creating exceptional outdoor walkways, patios, balconies, rooftop decks, terraces, and green roofs. To complement our large selection of porcelain pavers and Ipe wood tiles, we also offer Italian made ‘Eterno’ adjustable height pedestals for creating perfectly level, raised rooftop decks and terraces in a unique way that reduces the weight-load on building roofs and reduces installation time and materials. To extend our raised deck solutions for low height applications, Architrex developed solid rubber fixed height support pads with built in spacer tabs designed specifically for quickly laying our porcelain pavers over concrete patio slabs or other hard, flat surfaces. At our main warehouse in Maryland we stock significant quantities of all products to meet the needs of both our residential customers and the increasing volume of large scale commercial installations. Kimlor Innovative Home Fashions is a manufacturer and wholesale distributor of bed linens and home accessories. We market and distribute a range of home decor products, including comforter sets, daybed ensembles, futon ensembles, Flex-Fit (waterbed) sheets, towels, satin sheet sets, flannel sheet sets, dog beds, and shower curtains. Kimlor has a wholesale distribution channel of 800 US-based retailers. Kimlor distributes most of its home accessories products from its warehouse and manufacturing facility in Orangeburg, South Carolina, USA. Kimlor distribution relationships range from single unit drop ship to large EDI orders. MODLOFT is one of the fastest growing furniture brands in the U.S. Our collection is offered in over 1000 retailers (online and traditional), plus wholesalers and interior designers throughout North and South America. As an internet-ready modern furniture supplier, our drop ship program is perfect for online retailers or catalogers with virtual inventory, or for retail stores needing display pieces for their showroom. We invite you to open a trade account and see for yourself the opportunities and benefits of a MODLOFT relationship. For more information please contact Modloft. White Lotus Home of Highland Park, NJ has been supplying massage schools, spas, furniture and natural goods stores as well as individual customers with natural and organic, high quality bedding products since 1981. Many of our products are available for purchase at Whole Foods Market in Austin and Dallas, Texas; Boulder Mountain Futon, in Boulder, Colorado; Hardwood Artisans of Woodbridge, Virginia; Eco Shoppe in Austin, TX and Walnut Creek, CA, and many other retailers in over 20 different states and Canada. If you would like to open your own White Lotus Home store then please contact us today. Welcome to Novica, one of the world's leading providers of artisan crafted home decor, apparel and jewelry. Novica works with over 2,000 talented artisan groups and is supported by a global infrastructure of seven international offices and 100 dedicated sourcing, logistics and product design specialists. Pacific Trading is an importer of giftware, tabletop accessories, home décor accessories and dollhouse accessories based in Edmond, Oklahoma. Since its humble beginning in 1982, Pacific Trading has been experiencing tremendous growth and rapid expansion of product lines made from various materials. We owe our success to our goal in delivering only the highest quality of product and excellent distribution and customer service to our customers. It is our ultimate goal to become your number one source for quality giftware and collectibles. Phoenix Textile Corporation is one of the nation's leading providers of textile products and services for nursing homes and hospitals. Our success story in product innovation, customer service and growth has earned recognition as an INC 500 company. We are a Women's Business Enterprise (WBE) recognized by the Women's Business Enterprise National Council. The foundation of our success is Our Commitments. Phoenix Textile Corporation has quickly become the premier distributor of textiles to the long term care industry, and a steady competitor in the acute care marketplace. We take pride in our buying and sourcing abilities in an effort to improve your bottom line. Our Design products and services are where style meets functionality in the healthcare environment. We are recognized as the global leader in the manufacturing of healthcare, hospitality, & institutional textiles, apparel, surgical, incontinence care, decorative products & linen management services. Our worldwide manufacturing and distribution system allows us to deliver quality assured product at the lowest possible price. Organizations will continue to evolve seeking the highest quality at a delivered cost that meets their objective. We have demonstrated over the past 70 years our ability to meet the challenge and we will continue to provide the best products and services and systems in the industry. For 25 years Star Linen & Supply has been providing fine linens, amenities, small appliances, table linens, jan/san products, paper products and much more to the hospitality and healthcare industries throughout the world. Our commitment is to supply our customers with quality products, competitive pricing and unsurpassed customer service. We STOCK virtually every product you’ll need for your facility. Our distribution network throughout the USA is well stocked with linen and related products which enables us to offer you the quickest service and lowest prices available with an emphasis on zero back orders. Our long term relationships with our manufacturing partners, located domestically and abroad, ensures a wide range of products. Our distribution centers are strategically located throughout the USA to provide you with the fastest service possible. We have everything your customers need to make a new home, home remodeling and home decorating projects a success. We offer Kitchen and Dining items, Bathroom Fixtures and Accessories, Lights and Fans, Flooring, Bedding, Hardware, Interior Decor and more. We Drop Ship our SPR Home Fashions Retro Chenille and gingham Comforters- Chenille bedspreads, gingham curtains, gingham and chenille bedskirts and shams, gingham valances, sheer curtains and valances, solid broadcloth curtains, valances, bedskirts, pillow shams and more. We offer a great drop shipping program for Retailers who choose not to stock items and only buy as they sell. For more information please contact us today. Wildlife Decor was founded in 2001 to bring the best rustic decorating products to you. All of our products feature a wildlife or rustic theme and are a perfect addition to your home, lodge, or cabin. If you would like to add our products to your product line, feel free to contact us to receive our wholesale price discount. We want to help you grow your business and we offer an attractive dealer/distributor wholesale and volume price discount. World Buyers.com has been one of the premier wholesale gift suppliers to retail stores in the U.S. and across the globe. Few gift shop suppliers offer such a wide variety of wholesale gift selections as World Buyers. We sell to every type of gift shop, boutique, home and accessories stores, theme parks, hospitals, zoos and spas, just to name a few. Throughout the year, we travel abroad and add hundreds of new wholesale products so our gift store buyers always have unique, on-trend products to choose from. With thousands of products offerings, we have selections for any themed retail store. Our top-selling wholesale products include Chrysalis wholesale butterfly garlands and our expanding line of WB Gallery wholesale artwork at incredibly affordable prices! Our Emma Jean line of wholesale aprons blends vibrant fabrics with fashionable designs placing them in our top selling wholesale products . With over 50 choices, our Nature Under Glass Paperweights are hugely popular with themes like birds, sealife, flowers, travel, butterflies and much more! As one of the most current gift shop suppliers, our product evolution is constant. As such, we always discontinue products at 50%-80% discounts. Closeout products from gift wholesalers can be a great way to boost profit margins and in a slower economy wholesale closeouts from wholesale suppliers are invaluable to your bottom line.